The Royal Canadian Mint now has released all of its 2016 $20 silver coins that sell at their face values. Depicting the U.S.S. 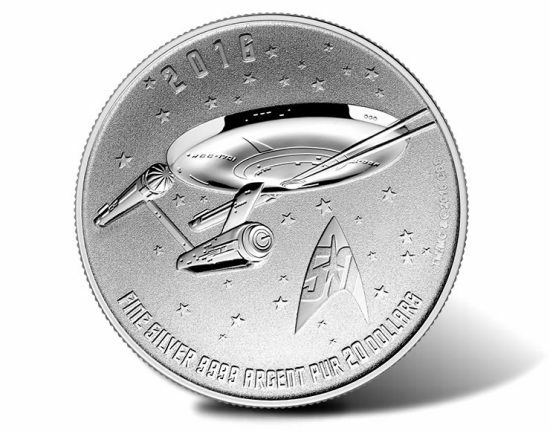 Enterprise NCC-1701 from the original Star Trek series, the third and final 2016 coin from the Mint’s $20 for $20 series launched earlier this month. Released annually since 2011, the $20 for $20 silver coins have been very popular with collectors. The majority have sold out. The $20 Star Trek coin, which is an officially licensed collectible, marks the 21st issue. Its reverse or tails side shows the starship Enterprise, a delta-shaped Starfleet insignia and inscriptions reading: 2016, FINE SILVER 9999 ARGENT PUR, 20 DOLLARS, and TM/MC &©2016 CBS. Obverses or heads side of each program coin offer Susanna Blunt’s portrait of Queen Elizabeth II with inscriptions of ELIZABETH II, CANADA and D G REGINA. 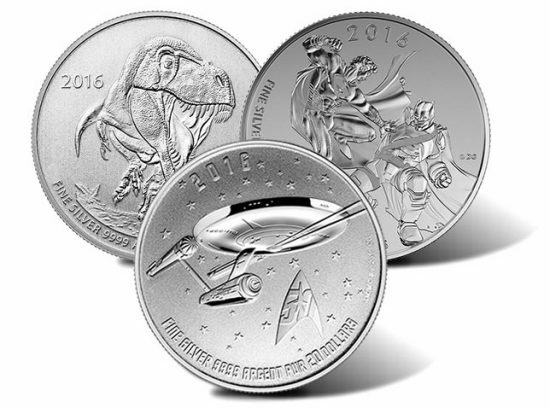 Order the 2016 $20 for $20 Star Trek Silver Coin or available prior issues by visiting the Royal Canadian Mint’s website at www.mint.ca. You may also use this affiliate link to go directly to the RCM’s $20 for $20 page. These coins are sold tax-free and ship free in the United States and Canada.